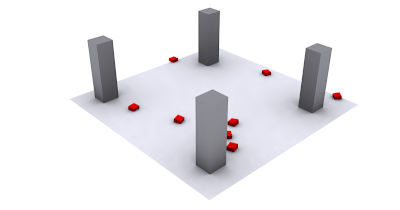 The second in what is looking like a series of posts on 3D Agent Based Modelling in cities – in short on placing crowd, pedestrian and transport behavior into 3D models. The agents are now aware of the environment around them and each other, as such they avoid collisions while wandering around the surface. As we mentioned this is ‘first step’ work and we are aware that there are advanced crowd simulations out there. We are taking a slightly different approach and as ever with the blog we will write a tutorial on the system soon as its more advanced.